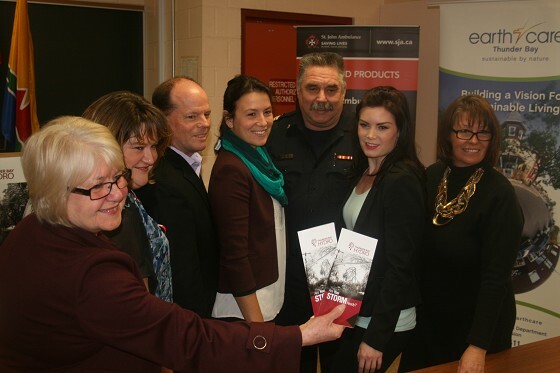 Thunder Bay Hydro in the fall launched the STORM READY campaign with a group of community partners. They are telling residents to “Know the Risks, Have a Plan and Make a Kit”. The message is backed up by an online quiz that tackles incorrect attitudes that, if left intact, would leave residents and their families quite vulnerable in a severe weather event. Brochures are being inserted into all Thunder Bay Hydro bills starting this month. Residents are encouraged to take a quiz to identify areas where they may have misconceptions about how to handle a storm-related emergency. Displays will be set up in local libraries. A local report compiled by EarthCare Thunder Bay1 warns that extreme weather events are expected to increase in the region. Other emergency planning exercises recognize that the Thunder Bay area has a high degree of probability to be crippled by a winter storm. These storms can cause interruptions in basic services and households that do not prepare ahead can be at risk of injury and even loss of life. The 2013 GTA Ice Storm and disturbing research findings2 show that most Canadians are not aware of their responsibility to be prepared to be without basic services in the event of a severe weather emergency. The STORM READY campaign is designed to encourage residents to review their personal household situation and plan ahead to take care of themselves and their family for the crucial 72 hours following the advent of an emergency. The online quiz is available at www.tbhydro.com/quiz . Victoriaville Mall. The messaging was developed in consultation with the Canadian Red Cross, St. John’s Ambulance, Lakehead Social Planning Council / 211, Thunder Bay Fire and Rescue, EMS, EarthCare Thunder Bay and the City of Thunder Bay.